Created in 1951, the Milwaukee Sawzall has been destroying wood, metal, nails, bolts, pipe and stone ever since. With it’s few moving parts, fast blade changes, variable speed, and a near unlimited number of blade options, the Sawzall is first and often only choice when speed and results are more important than precision and stealth. 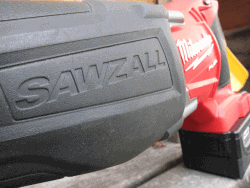 The Milwaukee Sawzall is a reciprocating saw of which there are many brands. 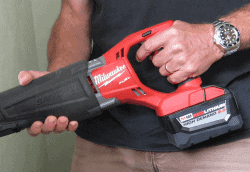 Most major power tool manufacturers sell a reciprocating saw, but the Milwaukee Sawzall is the original. Lately battery-tool options have pushed the reciprocating saws well beyond the extension cord, outside the construction site and into the hands of fire/rescue personnel. And from there it was a short hop into the survival kit for those who are a little more prepared than most. The real breakthrough came with the high-capacity Lithium-Polymer batteries that give the battery-powered Sawzall near-corded performance. With 18 volts and 9 amp-hours of run time, the ability to swap blades and batteries will keep the Sawzall in the destruction fight until the job is done. Using a corded saw, here’s a video showing 73 seconds of saw time to cut a car in half. Reciprocating saw blades come in many lengths but three main flavors of cutting prowess: those for wood (mostly), those for metal (mostly) and those for both. There are a few less common options for cutting cast iron, stone, trees, and plastics, but the survival/rescue side usually leans towards the combination blade or metal cutters. Much of the cutting magic is found in the dance between number of teeth per inch and the reciprocating speed of the saw. 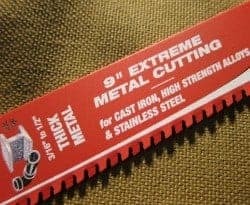 For instance, a popular general purpose survival choice might be the six-inch 18-tooth metal cutter, or perhaps the nine-inch 12-tooth combination blade. But luckily, you can have both. And others. And more. By finding the cutting sweet-spot of blade type and blade speed, the ideal recipe for slicing up whatever you’ve got can be found quickly. Full speed is always an option, but it might just dull your blade faster and heat up your workspace. Some specific uses include using the five-tooth Sawzall Axe blade to cut through windshield glass and reinforced protective plastics. Or the 14-tooth Sawzall Torch blade to slice through chain link fence like butter. 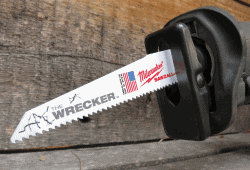 Need to go through a wood door with metal hardware, the Sawzall Wrecker blade is a good choice. Slicing bolts and rebar is child’s play for the right blade, and cutting your way into a vehicle or out of a building is a powerful breaching option camouflaged as a common power tool. If I had to choose only one blade, it would be the nine-inch 8-teeth per inch Diablo Steel Demon carbide- tipped thick-metal cutting blade. 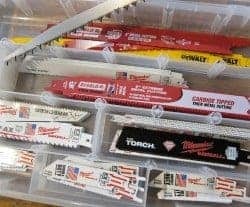 A few companies even make specific “rescue/demolition” blades in bright emergency yellow color and averaging 12 teeth per inch in lengths from six inches to 12 inches. Some of the best blade choices regardless of length or teeth is bi-metal technology. Bi-metal means that the blade is actually a composite of two metals, a harder high-speed steel for the teeth, and a durable and flexible spring steel for the blade body. The two metals are welded together creating a stronger blade that stays sharp longer. When using the Sawzall, eye protection is a must, and ear pro is highly recommended. Gloves are also a good idea because there is nothing subtle about the way the Sawzall cuts. It’s violent, aggressive, and permanent. Once the jackhammer-like action of the Sawzall starts up, the blade strokes back and forth at hundreds to thousands of times a minute, or if the blade jams, the saw starts slam dancing, the blade bends or snaps, or usually a combination of the above. A key element to successful and safe Sawzalling involves keeping the shoe tight against your workpiece. The shoe is the adjustable metal plate between the blade and the saw body. By pushing the shoe against what you are cutting, the reciprocating motion is only with the blade. But if you loosen your grip, the saw will buck violently. Because the Sawzall cuts with impunity, you must take care around electrical and gas lines, and the heat generated by the sawing friction can start a fire. If rescuing a person, don’t forget that the jabbing blade on the far side of cut can do serious damage to flesh so apply the necessary safeguards and distance when operating the saw. Additional protection should be provided when glass and hot metal flakes can rain down or fly around in the wind. Pulling metal shards out of an eyeball is hard enough in an emergency room. Adjusting the depth of the shoe keeps fresh blade in contact with the material to be cut while allowing a firm saw placement. The Sawzall can behave like a small chainsaw as well when using one of the pruning blade choices. The heavy tooth design is similar to bow saws and camp saws and cuts with the same speed and flying sawdust. Another area where the Sawzall excels is with large game butchering. If metal presents few problems for the Sawzall, then bone and gristle will do little but wet the blade and damen the noise. 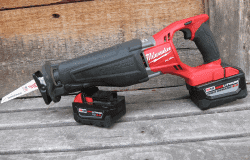 Packing an 18 volt Milwaukee Sawzall in your kit might be on the advanced side of preparedness, but many of the battery-powered tools and lighting solutions popular in shops and construction sites can make important contributions to your initial survival options.